America currently has the most inequality, and the least equality of opportunity, among the advanced countries. While market forces play a role in this stark picture, politics has shaped those market forces. In this best-selling book, Nobel Prize-winning economist Joseph E. Stiglitz exposes the efforts of well-heeled interests to compound their wealth in ways that have stifled true, dynamic capitalism. Along the way he examines the effect of inequality on our economy, our democracy, and our system of justice. 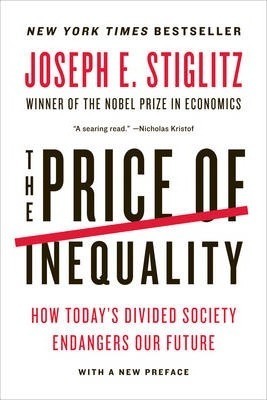 Stiglitz explains how inequality affects and is affected by every aspect of national policy, and with characteristic insight he offers a vision for a more just and prosperous future, supported by a concrete program to achieve that vision. "The single most comprehensive counterargument to both Democratic neoliberalism and Republican laissez-faire theories. While credible economists running the gamut from center right to center left describe our bleak present as the result of seemingly unstoppable developments-globalization and automation, a self-replicating establishment built on 'meritocratic' competition, the debt-driven collapse of 2008-Stiglitz stands apart in his defiant rejection of such notions of inevitability. He seeks to shift the terms of the debate." -- Thomas B. Edsall "An impassioned argument backed by rigorous economic analysis."